Second, good sponsorship undergirds the whole weekend with sacrificial love on behalf of each pilgrim. Sponsors use discernment in recruiting pilgrims, embody the personal commitment of the community to each pilgrim, and provide personal acts of agape during the three days for the pilgrims. These acts of agape include the sponsor’s personal preparations for the weekend, presence at Send off, Candlelight and Closing, follow-up after the weekend, and prayer during the entire process. Third, good sponsorship is the foundation for a healthy, effective Emmaus movement that is fulfilling its true purpose – the development of Christian leaders and the renewal of the church in ministry. The strength of any Emmaus community is a direct result of its recruiting practices. If the community is committed to recruiting strong church leaders for the purpose of strengthening the local church, then the community will be a strong, vital force in the renewal movement. If, on the other hand, the Walk to Emmaus is looked upon as a hospital where every human ill can be cured, it will have a weakening effect on the entire community. The aim of a sponsor should not be to “get all my friends to go”, to fill up the weekend, to fix people’s problems, or to reproduce one’s own religious experience in others. Rather, the aim of the sponsor is to bring spiritual revitalization to Christians who, in turn, will bring new life and vision to the work of the church in the congregation, home, workplace, and community. The aim of sponsorship is to build up the Body of Christ. Emmaus is right for many people – but not for everyone. The religious background or emotional condition of some people may make Emmaus an improper discipleship tool for them. Others may be unsuitable for sponsorship because of the negative effect they might have on an Emmaus weekend or the divisive influence they might bring to the church. Sponsorship requires sensitivity to these factors. 1. Pray for the person’s openness to God’s call to discipleship, not for how to get him or her to go on a Walk. 4. Continue to pray for your prospective pilgrim. Once the pilgrim has been assigned to a Walk, begin your preparations and enlist the support of their pastor. Please make sure that all preparations for your pilgrim’s weekend are properly taken care of. Be sure you understand what forms of agape are appropriate for the weekend. This document does not list all sponsor requirements. The registration person will identify for you the activities you will need to partake in. Also, the NGWTE database provides certain “Aids for Sponsors” on the page following sign-in that can help you. 5. Support the Walk through your participation in the 72-Hour Prayer Vigil and your presence at Sendoff, Candlelight and Closing. Support the pilgrim’s family by house-sitting, baby-sitting, feeding pets, watering plants, or just checking in with a spouse to see if any help is needed. For this reason it is best not to sponsor more than one pilgrim or couple at a time. 6. Encourage the pilgrim in his or her Fourth Day involvement. Talk to them about their weekend experience. Help the pilgrim find or start a reunion group. Take the pilgrim to the first Gathering after their Walk. You could even offer to baby-sit so your pilgrim can attend a Candlelight. 8. Inform the pilgrim about ways to serve the Emmaus community on future Walks, creating agape and writing letters to other pilgrims. Third, the equal commitment rule results in increased participation of many grateful husbands and wives who probably would not have attended a Walk otherwise but did so in order to make it possible for their spouse to participate. While their initial motivation for going on a Walk may not have been personal, they came to realize during the course of the weekend that the Walk was also meant for them. The equal commitment rule does not mean a wife can never go to Emmaus unless her husband has gone first. It is always best to schedule spouses’ participation in the same set of weekends so they can share their experience and support each other. However, circumstances may arise when husbands or wives must attend their Walks at different times. In these cases, the order of participation is secondary and becomes a practical matter. While a pilgrim may not know what questions to ask, you do not need to tell them everything that will occur during the three days. However, keep in mind there are no secrets! Saying to a pilgrim that you can’t tell them anything about the Walk potentially creates unnecessary suspicion and anxiety. And for clergy and staff leadership, this posture often builds a wall of division that results in an “us vs. them” mentality against the Emmaus community. There is no reason to shroud the event in secrecy. This practice has probably done more harm to the movement than people realize. You can share many things about Emmaus without revealing some of the unique and meaningful experiences. Here are some suggested items to cover with a pilgrim. 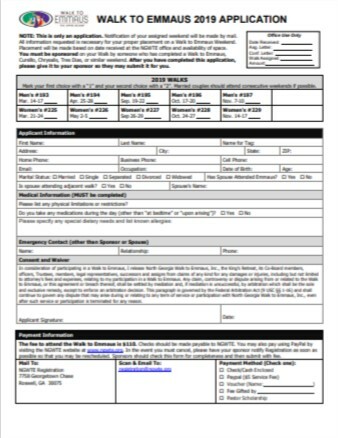 • Applications should be mailed or faxed to NGWTE Registration by the sponsor. The sponsor should do all communication with Registration regarding a pilgrim unless circumstances dictate otherwise. * Much of the material contained in this document is written and excerpted from the following two resources that are available through The Upper Room website at http://www.upperroom.org/emmaus.